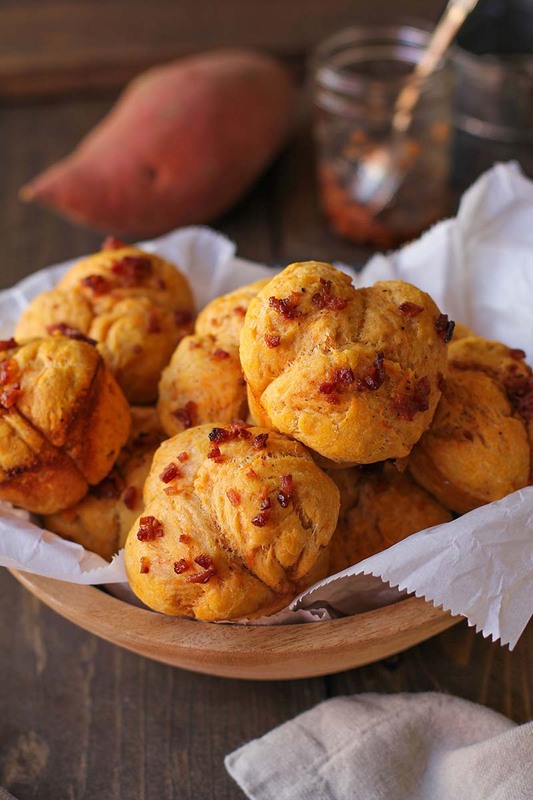 Fluffy sweet and savory sweet potato pull-apart muffins with maple bacon glaze. These delicious muffins can easily be made gluten-free, and are perfect for sharing at brunch or dinner. Combine the flour, coconut sugar, sea salt, and cinnamon in a bowl and stir until well-combined (dry mixture). Stir together the warm water, yeast, and honey in a large mixing bowl and allow it to sit and activate for 8 to 10 minutes. Add the beaten egg, melted butter, and mashed sweet potato to the mixing bowl with the yeast mixture, and stir until well-combined (wet mixture). Add the flour mixture into the bowl with the wet mixture one cup at a time, and stir until combined. By the time you add the third cup, the dough should be somewhat stiff. Turn the dough out onto a floured surface and knead for 1 to 2 minutes. Form the dough into a round ball. Lightly oil a large mixing bowl and place the ball of dough in it. Let sit for 45 to 50 minutes, until dough has risen. Lightly oil a 12-hole muffin tray. Section the dough out into 36 small dough balls and place 3 dough balls into each hole of the muffin tray. Cover with plastic wrap and allow dough to sit an additional 45 to 50 minutes. While dough is resting, prepare the maple bacon glaze by stirring together the cooked, chopped bacon and maple syrup in a bowl. Preheat the oven to 375°F. Spoon the maple bacon mixture over each roll and place muffin tray on the center rack of the oven. Bake for 15 minutes, or until rolls are cooked through and golden brown. Recipe created by The Roasted Root.